In September, China flicked the switch on the world’s largest radio telescope. 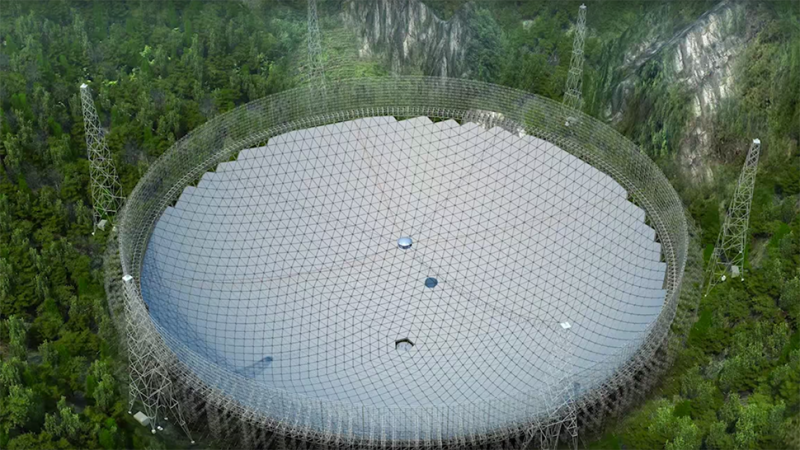 The unusually large dish in an isolated area of Guizhou province needs radio silence to hone in on potential signs of alien life and distant pulsars, but researchers fear that a huge influx of tourists could be rendering the $180 million dish useless. Now, a choice between a booming local economy and the advancement of science looms on the horizon. According to the South China Morning Post (SCMP), government statistics released this month show that in the first half of 2017, nearly four million tourists visited “FAST” (Five-hundred-meter Aperture Spherical Telescope). Tourism officials estimate that 10 million tourists will visit the the highly-sensitive device this year. “That will be as many as the tourists to the Great Wall in Beijing,” the official announced. “Here we have a new wonder of the world.” China did such a great job of building something impressive, that its core function is at risk of being nullified. The FAST telescope is 200 meters (656 feet) larger than the Arecibo Observatory in Puerto Rico which, at 305 meters (1,000 feet), was the previous record holder for massive radio telescopes. These devices listen for faint signals that other equipment can’t pick up, like signature gravitational waves from magnetized stars that disturb radio signals. In addition to the always intriguing possibility of picking up signs of extraterrestrial life, researchers hope to better understand the makeup and origins of the Universe. But a combination of spectacle, local development, and national pride is making that electromagnetic wave environment decidedly less sound. According to The Guardian, “One of the scientists behind the project recently claimed that if the telescope was filled with wine, each of the world’s seven billion inhabitants could fill about five bottles from it.” That’s one big, shiny, impressive landmark. And according to the newly released government statistics, most of the people flocking to get a glimpse of FAST are coming from inside the country. While taking pride in their country’s achievement, they may be preventing the kind of scientific discoveries that would truly make history. “We understand their urge to develop the economy and get rid of poverty [in the impoverished region],” an anonymous researcher at the facility tells SCMP, but unless some kind of compromise is reached it’ll be hard to make sure the telescope is working at its optimal potential. Locals have built 46 hotels and more than 100 restaurants to serve the influx of tourists. A nearby theme park is getting 10 times the number of visits it was designed to handle. And though a special permit is required to use electronic devices like smartphones, radios, and digital cameras within a five kilometer (3 mile) buffer zone, scientists believe a new investigation is needed to determine how many people are violating restrictions. As far back as September of last year, experts were anticipating this issue. An unnamed engineer from the project told Sixth Tone, “It is estimated that the daily operation of FAST costs 400,000 yuan.” That’s about $60,000, which is, of course, a lot of money to waste in a day, not to mention the time of scientists that are so specialized that it’s been difficult to find someone to run the project. But compare that figure to 4.6 billion yuan (about $690 million) that was brought to the area through tourism and you can see how a conflict between parties might arise. The telescope is still in a two-year calibrating phase, but tests have already pulled in data from a pulsar star 1,351 light-years away. If tourists are found to be interfering with FAST operations, authorities are going to have to determine whether the economic benefits outweigh the possibility of listening to the stars that are over 13.7 billion light-years away.